Amazing giclee art print based off of the Star Wars universe! Image features little Han Solo playing with a toy blaster pistol as a child. A limited edition of 150 hand-numbered pieces! Sometimes, you can look at a child and catch a glimpse of that child's future. 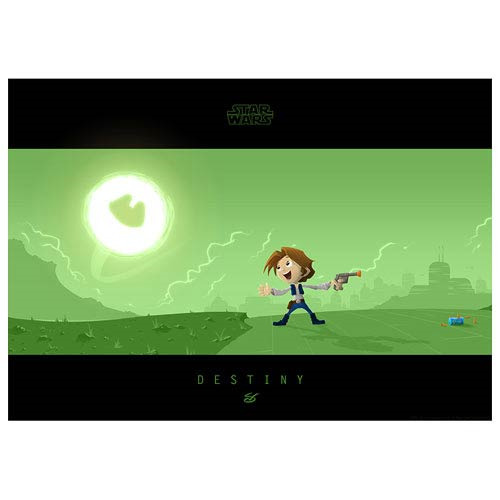 Looking at this Star Wars Little Han's Destiny Paper Giclee Print, who would have known that the small boy practicin quick-draw with a toy laser blaster pistol one day on Corellia was going to grow up to oppose the evil rule of the Galactic Empire and cause its destruction? This fantastic giclee features a wonderful and whimsical image of young Han Solo as he plays alone with a toy blaster pistol on the Correllian landscape. This great giclee has been printed on paper and features the Star Wars logo along with the solitary yet significant word, "Destiny." Along with being a limited edition of 150 pieces, this fantastic giclee has been hand-numbered and measures 19-inches wide x 13-inches tall.